Old style printing techniques on your iPhone. 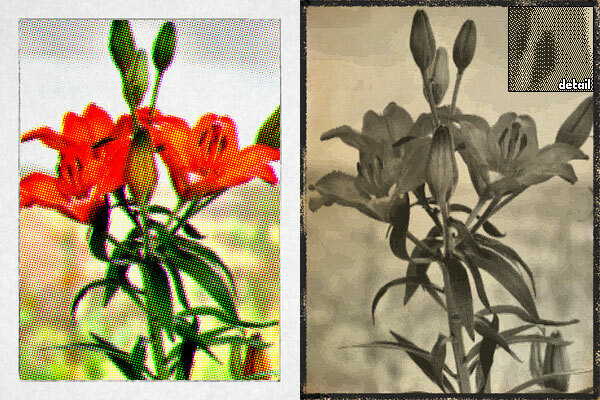 Lithogram emulates the looks of halftone lithography on iPhone. Kuviz’s app takes its name from the lithography technique, in which a drawing is delineated with wax or other water repellent substance on a smooth surface, like that of a stone (in ancient Greek, the word lithos means stone) or of a metal plate. After proper treatment, ink spread on the surface will only adhere to the water repellent substance, which forms the positive part of the image. By pressing the inked surface on paper sheets, a series of prints can be obtained. Lithography was for a long time one of the most widely used printing techniques. Lithogram allows both photo and video taking. 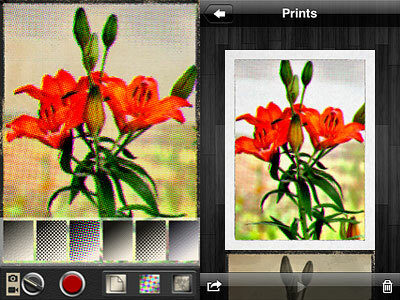 The app uses a a real-time preview to let users see how effects and textures affect what the camera is capturing. It’s also possible to load photos from the Camera Roll, by tapping on the small picture icon appearing at the top of the screen. Saved photos and videos are stored in the Prints gallery. From there, you can delete, save to Camera Roll or email photos and videos. There are in total 6 paper textures and 6 halftone styles to choose from. Halftone, which includes both color and monochrome effects, applies different patterns (dots, diamonds, crosshatch and lines) to still images and videos. Papers not only add texture and, in a few instances, a border, but also color presets for giving different tints to monochrome effects. The effects, however not many, are nicely done, especially if you look at the edited photos at their actual resolution. No significant detail is lost. The effects work best on images with good contrast and predominant subjects, like close-up shots. Different combinations of textures and halftones. There is a problem when sending images created with Lithogram via email directly from within the app: the files are not read as images but as videos. It’s not a big deal, honestly, as you can ignore the fact the computer tries to open them using Quick Time by default. Still, it might be confusing. If you save to Camera Roll and email the images from there, nothing weird happens. The greatest problem with Lithogram is the saving resolution. The maximum allowed for still images is 1280×960 pixels, while for videos it’s a very disappointing 426×320 pixels. Photos loaded from your device are saved at the same resolution of those taken with Lithogram’s built-in camera, so beware. This is partly justified by the real-time feature. However, we know that other apps like Lumière use the real-time quite successfully even with high resolution saving. Given this is version 1.0 of Kuviz’s app, I am confident improvements will be made with future updates. Lithogram is currently on sale and downloadable at the special price of $0.99 (€0.79/£0.69)! Compatibility: iPhone (3GS, 4), iPod Touch (4th), iPad 2. iOS 4.1 or later. Next post: FX Photo Studio 4.0 Is Out!